Are we in for a VR-rich future at the hands of Oculus and Valve? Though Valve has its own virtual realtiy tech that it has been demoing, the company worked with Oculus on the Crystal Cove VR headset, which was showcased at CES 2014. 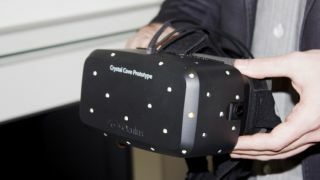 Michael Abrash, who heads Valve's R&D department, led a panel at Steam Dev Days on virtual reality and revealed that the company had collaborated with Oculus on the tracking features of Crystal Cove. Specifically, the tracking feature uses markers, sensors and a camera to track the position of the user's head and body. While some who have tried Valve's VR prototype are saying that the tech is much better than that of the Crystal Cove, Valve isn't trying to compete with Oculus' VR offering by any means. A slide from Abrash's talk, taken by Steam Dev Days attendee Dave Oshry, shows that the company is planning to continue developing a strong relationship with Oculus on the VR front. With this is mind, it is more likely that Valve will continue to work on the R&D behind VR, while relying on a strong collaboration with Oculus to drive marketable VR wearables.